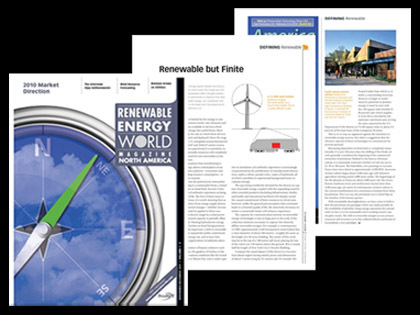 Carl Stein's article in Renewable Energy World North America 'Defining Renewable' segment is available in print and for download now. As Carl concludes: "With remarkable shortsightedness, we have come to believe that the petroleum-era paradigm which was made possible by the availability of plentiful, cheap energy represents the natural order. In fact, it is not sustainable and is tending toward catastrophic results. The shift to renewable energies as our primary resources will reconnect us to the cultural/ethical continuum of humankind; a new paradigm." Read the article here. or download PDF .